Subject :- Non-acceptance of Nomination Form for Life Time Arrear (LTA). 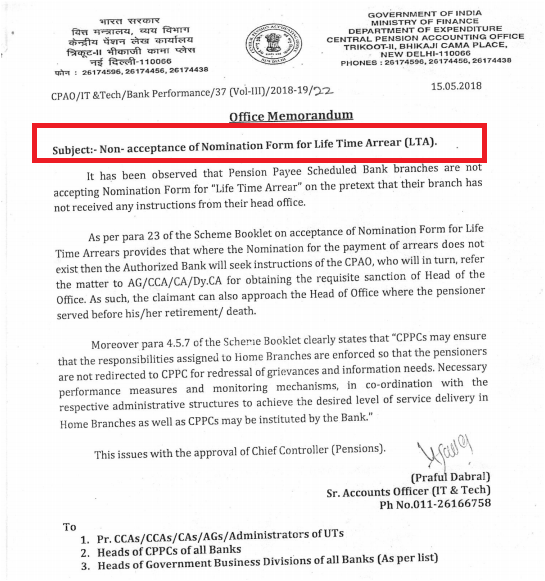 As per para 23 of the Scheme Booklet on acceptance of Nomination Form for Life Time Arrears provides that where the Nomination for the payment of arrears does not exist then the Authorized Bank will seek instructions of the CPAO, who will in turn, refer the matter to AG/CCA/CA/Dy.CA for obtaining the requisite sanction of Head of the Office. As such, the claimant can also approach the Head of Office where the pensioner served before his/her retirement/ death. Nomination Form for Life Time Arrears provides that where the Nomination for the payment of arrears does not exist then the Authorized Bank will seek instructions of the CPAO, who will in turn, refer the matter to AG/CCA/CA/Dy.CA for obtaining the requisite sanction of Head of the Office.